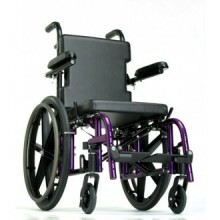 The Zippie 2 is a lightweight folding wheelchair designed primarily for children. Its locking crossbraces give it an easy-pushing, solid feel while the swing-away footrests and quick-release components make it easy to transport. Like many of its other Zippie counterparts, the chair is designed to adapt effortlessly to your child's rapid growth, abolishing the need for replacement chairs as your child gets older. Also featured with the model is an extremely durable hub lock, which is now stronger than its ever been. Wheels lock securely into place, which helps to eliminate the dependence on the rear wheel's tire pressure for a safe, locked position. Because of the chair's user-friendly design, adjustments are seldom necessary and cables are conveniently kept out of the way, making engagement of the hub lock a snap. The locking mechanism provides multiple mounting positions for quick and easy access. Seat Width 12" - 16"
Seat Depth 12" - 16"
Overall Width 20" - 24"
Rear Wheel Size 18" - 22"
Click the button below to add the Zippie 2 Pediatric Wheelchair to your wish list.